It’d be difficult for any pitcher to epitomize the fact that relievers are weird than Danny Farquhar. After alternating between good and bad seasons, and bouncing between Triple-A and the majors the last few seasons with Seattle and Tampa Bay as a result, the veteran right-hander finished 2016 on a strong note and entered this season as one of the primary bullpen pieces for a Rays team that had thoughts of contention. But after walking basically everyone under the sun through the first 3 1/2 months and with Tampa in the thick of the wild card race, he was cut in July and promptly picked up by the White Sox, spending a few weeks back down in Triple-A before an August call-up in the aftermath of the White Sox Great Reliever Purge of 2017. 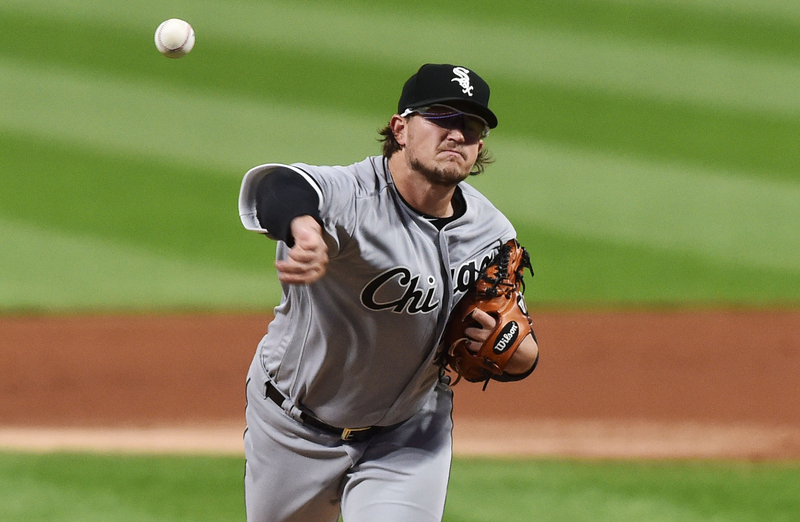 Like a good number of the pitchers to take the mound for the White Sox during the final two months of the season, Farquhar’s role was simply to eat innings, and he ate exactly 14 1/3 of them. But he also has the stuff and reputation that it wouldn’t be out of the question for him to be a member of the bullpen during what will likely be another rebuilding year in 2018. He has an out pitch in his changeup, and despite striking out only 12 in his time with the White Sox, has a career K/9 of 10.2 in 264 career innings that portends success if and when he’s commanding. Farquhar isn’t a shiny new arm or anyone you’d expect to be on the next White Sox contender, but he’s interesting enough as a rebuilding bullpen option that I guess it’s probably time to make sure you know how to spell his name. In early September Nick Schaefer and I were putting a list of players together for the White Sox player comments in next year’s Baseball Prospectus Annual. We included every player on the team’s 40-man roster, pretty much any prospect with any hint of potential, and a few other random organizational guys we thought were interesting. The list grew to 70. The day the list was due for submission, the White Sox surprisingly promoted Jace Fry to the major league roster. Fry was not among the 70 White Sox players we were set to include. It’s not that we weren’t aware of Fry, it’s just that expectations for the former third round pick who’s already had Tommy John surgery twice in his baseball career weren’t exactly sky high. But the White Sox relief situation became, well … we’ve covered that already. The second surgery sent Fry from semi-enticing starting pitching candidate to someone whose chances of sticking around as a reliever were slim, but his numbers at Double-A Birmingham warranted a September trial where he got 6 2/3 innings of major league experience he’ll never have to get back. The perks of pitching for a rebuilding organization afforded him that opportunity, but the odds of a prolonged major league career remain long. Two years ago if you’d have told me that in 2017 Carson Fulmer would walk nearly five batters per nine and post a 5.79 ERA in Triple-A Charlotte I’d have quickly identified you as some sort of soothsayer and asked you a bunch of sports results I could bet on so I could make a lot of money. I’d then have realized what you told me and become really sad. Since Fulmer was selected eighth overall in the 2015 MLB Draft, the White Sox have added a good many quality arms to their system, making Fulmer’s success less of a requirement than it was at the time. That’s not to say Fulmer’s struggles this season weren’t troubling, just that it’s a lot easy to muster a failed pitching prospect when your team has five or six of them than when they have just one or two. Of course, Fulmer is not yet in the category of “failed pitching prospect” given he just completed his second full season of professional baseball and showed glimpses of why the White Sox still believe he can be an impact starting pitcher during the last month of the season. September stats are tricky to decipher, but after struggling against Triple-A competition for the majority of 2017, back-to-back September starts where he struck out a combined 14 and allowed just two earned runs in 12 innings is something to build off of, if nothing else. Still, Fulmer’s pendulum is definitely tilted closer toward “reliever” than “starter” at this point. Fulmer’s stuff has always been such that you can see the potential if and when everything’s clicking, but while he’s shown glimpses, the command hasn’t been consistent enough for him to put it all together for any lengthy period of time. When his fastball has the kind of life we saw in September and he’s throwing it for strikes, it makes his offspeed stuff that much more dangerous. When none of that is happening, walks and dingers usually come in bunches. We’ve seen more of the latter during Fulmer’s time in the White Sox organization, including in 2017, but enough of the former to envision a world where Fulmer re-adds his name to the list of White Sox pitching prospects on which to dream.